Hanoi (VNA) – The Consulate General of Vietnam in Hong Kong and Macau (China) on August 23 held a banquet at the Shangri-La hotel in Hong Kong to celebrate the 72nd anniversary of Vietnam’s National Day (September 2) and the 50th birthday of ASEAN. The event was attended by Hong Kong officials, international friends, staff of Vietnamese representative offices and Vietnamese expatriates in Hong Kong. Speaking at the banquet, Vietnamese General Consul to Hong Kong and Macau Hoang Chi Trung highlighted the challenges Vietnamese people overcame to protect national independence. Thanks to the achievements of more than three decades of Doi moi (reform), Vietnam has become an open and vibrant economy with annual economic growth of around seven percent, helping improve livelihoods, he said. Trung said that Vietnam pursues a policy of independence, self-reliance, peace, cooperation and development, diversification of external relations, proactive international integration and is a reliable and responsible member of the international community. In past years, Vietnam and the Chinese special administrative region have enjoyed stable relations, Trung said, adding that both sides have made significant achievements in economic and trade relations. Currently, Hong Kong is the sixth largest investor in Vietnam with 1,214 projects valued at 17.57 billion USD. He expressed his hope that cooperation between the two sides will be further consolidated. 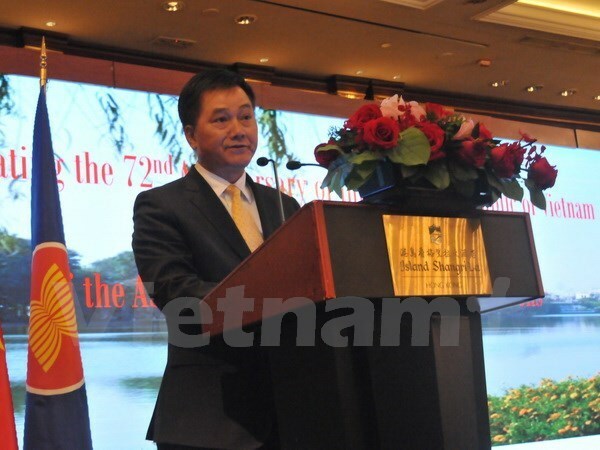 Meanwhile, Chief Secretary for Administrative Office Matthew Cheung Kin-chung lauded Vietnam’s achievements, while saying the country has become an ideal destination for Hong Kong tourists.